Buenos Aires has a deserved reputation for being one of South America’s most cosmopolitan capitals. With so many options to choose from, any visitor needs a good place to hole up after a busy day taking in the sights or night out partying. Mansión Vitraux fits the bill perfectly. 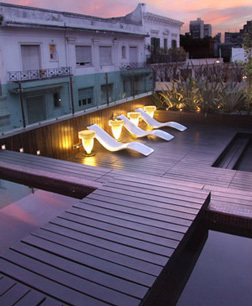 Located in the city’s historic San Telmo district, the hotel’s concept for the interior incorporates some of the local neighbourhood’s reputation as an old but trendy bohemian district known for its painters, poets and independence heroes. The texture of the aged cobbled streets or weathered pride of the 17th century domed churches – visible from the haven of the hotel’s roof terrace- are picked up in the warmed tones and rich textures of the décor, albeit translated into an eclectic mix of the antique and the fiercely contemporary. Within the discreet exclusivity of Mansión Vitraux – there are only twelve rooms- a restrained take on modernity prevails in the public spaces whilst the rooms, each with an individual interior, range from the languidly romantic to an upmarket version of macho; dark woods, cool earthy tones and leather. What else might one expect in a country so renowned for its steaks? But Mansión Vitraux is hardly a cliché when it comes to cuisine. The restaurant –headed up by Geraldo Alcaraz, Gonzaio Trigo and Diego Lachner- offers an international take on a contemporary Argentinean cuisine in which the flavours of Patagonia come through strongly. All in all, a reason to make the trip if you don’t already have one planned.